Perhaps the most remarkable language in the Bijan Kian indictment appears in both the conspiracy 18 USC 371 and the 18 USC 951 foreign agent counts. In both, the indictment alleges that Kian (referred to by his legal name Rafiekian here) and Kamil Ekim Alptekin both acted, themselves, and caused others to act as unregistered foreign agents. While not explicitly stated, the reference to Mike Flynn throughout the indictment as Person A — the only unindicted co-conspirator so identified — makes it clear that the government believes that’s what Flynn was doing, acting as an agent of Turkey. And the timeline for the conspiracy goes up to March 2017. One of Trump’s top foreign policy advisors and, for almost a month, his National Security Advisor, was an agent of Turkey. That fact, and the indictment as a whole, raises further questions about why Flynn got off so easy: a false statements charge for which he’ll do no time, unlike the 15 years his business partner is facing (though he won’t get that). And that outcome has raised still other questions about how Flynn could be useful to prosecutors, having admitted he’s a liar, yet having escaped all consequences for his actions. How can Flynn testify, commentators wonder, given that he was not charged for his role in the conspiracy? Aside from quipping “flip early and often,” I think the Kian indictment provides clues — clues that I’ve long suspected have parallels in the Mueller investigation. The indictment focuses just on the op-ed purportedly authored by Flynn that appeared in The Hill on election day, though we know Flynn’s company did more than that for Turkey. By focusing on the op-ed, DOJ can trace what happened with language Kian used to describe Fethullah Gulen. It was used in early August, before the conspirators started hiding the role of Turkey in the project. Let me give you a real life experience: 1978: A soft spoken cleric sitting under an apple tree in Neauphle-le-Chateau in France looked so harmless. Spoke of equality and spirituality, declared that if he were to gain power, he would go to a religious shrine and will not get into politics and governance. Sound familiar? Well, the world neglected to take the layers off the ink blot in 1978. One year later, from the place under the apple tree, The soft spoken spiritual man led the Islamic Revolution in Iran …. 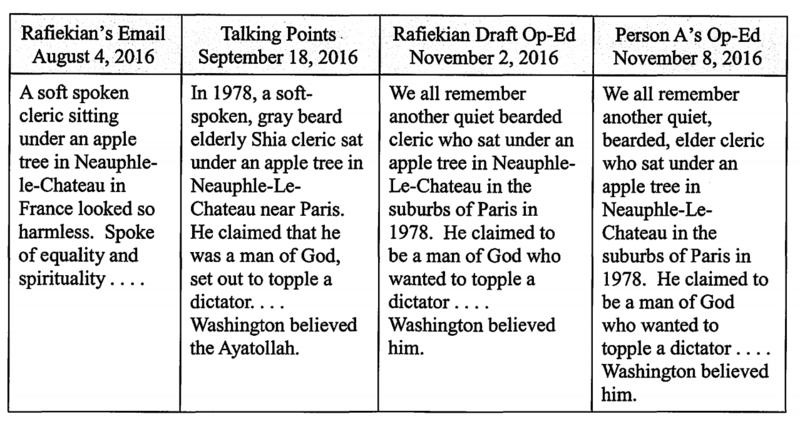 The indictment then shows how the apple language appears in talking points for a key September meeting with Turkish officials. On or about September 18, 2016, in preparation for the meeting with the Turkish officials, RAFIEKIAN sent ALPTEKIN a document entitled “Background and Talking Points,” which contained approximately twenty talking points for the meeting, all of which concerned the Turkish citizen, the Turkish citizen’s movement, or the Turkish citizen’s charter schools in the United States. And then the same language shows up in both a draft of the op-ed Kian wrote for Flynn to slap his name onto, and in the op-ed as it appeared in The Hill. The apple language serves as the marker showing the continuity between the project originally explicitly backed by Turkey, at the time ironically named “Truth,” and the project after it got renamed “Confidence” as part of an effort to hide Turkey’s role by using Alptekin’s company as a cut-out. And virtually every step of that process was conducted over email or other communication methods that the FBI could easily collect. Flynn’s genius co-conspirators — at least in this particular foreign agent conspiracy — even sent emails that noted that they were hiding details in other written documents. DEAR FBI, they might as well have written, LOOK HERE FOR THE SEKRITZ. At least as laid out, virtually all the evidence needed to convict the co-conspirators is written down. As noted, much of this was in emails (the word appears 33 times in the indictment). There were two conversations via Skype, a Section 702 provider, as well as one text sent via Skype. Flynn sent one text memorializing a meeting with Alptekin referencing one of the Turkish Ministers who were their real clients. There were multiple financial wires. The only overt acts described in the indictment that could not have been captured by the FBI or collected after the fact were one meeting, some lobbying activities, and some weekly phone calls. On or about the evening of September 19, 2016, Person A, RAFIEKIAN, ALPTEKIN, and other members of the project met in New York City with Turkish Minister #1 and Turkish Minister #2. The conversation centered on the Turkish citizen and the Turkish government’s efforts to convince the U.S. government to extradite the Turkish citizen to Turkey. In or about September and October 2016, RAFIEK.IAN and others involved in the project visited with and lobbied a member of Congress, a Congressional staffer, and a state government official in an attempt to depict the Turkish citizen as a threat who should be returned to Turkey and to persuade them to hold Congressional hearings concerning the Turkish citizen. All of those, however, also included other team members, members who didn’t lie to the government and aren’t being charged as co-conspirators. That leaves one other key piece of evidence the government might have needed help to collect: communications with the lawyers who filed the false FARA filings. While Mueller was able to get a crime-fraud exception to get communications from the lawyer who did Paul Manafort’s false FARA filings, once Flynn flipped he could have voluntarily waived privilege to make those documents available to the government. Indeed, I wonder if that’s what’s hidden in a key redaction in Flynn’s cooperation addendum. In other words, there is a non-liar witness (or document) for every overt act in this indictment. They don’t need Flynn to sit on the witness stand and describe the conspiracy, as laid out. They can just have his service providers provide authentication of all the communications and have his former colleagues testify, along with his lawyers, now freed of any privilege obligation. Critically, for a national security investigation like this one (and, I assume, for the Russian one as well), I’m sure Flynn described at more length everything else that went on. But the government doesn’t need that information to prosecute these crimes (except insofar as his cooperation would have made it very easy to get warrants for the information Flynn didn’t hand over himself — and his own sentencing memo makes it clear he did hand over much of it). It needs that information for counterintelligence purposes. And that’s why they were able to move towards sentencing without his testimony in court: because he may not need to give testimony in court. The government has secured other, more reliable witnesses for that testimony. As I said, I’ve long suspected this was true of Flynn’s cooperation on the Mueller investigation, as well. When the government, in describing his cooperation, said his decision to flip “likely affected the decisions of related firsthand witnesses to be forthcoming with the SCO and cooperate” (which is followed by the last, entirely redacted, sentence in the memo), they are probably describing how by pleading guilty to lying himself, he led to their ability to get better, more reliable witnesses for much of the relevant testimony. Update: Took out a reference to NSA; Alptekin may be a green card holder; if he is, he couldn’t be a legal 702 target.